Saturday September 22nd 1883 I was busy about the house all the forenoon and went to town as soon as I ate my dinner to order groceries. It came on to rain so I was obliged to come home in a shower. I was busy from that till bed time. 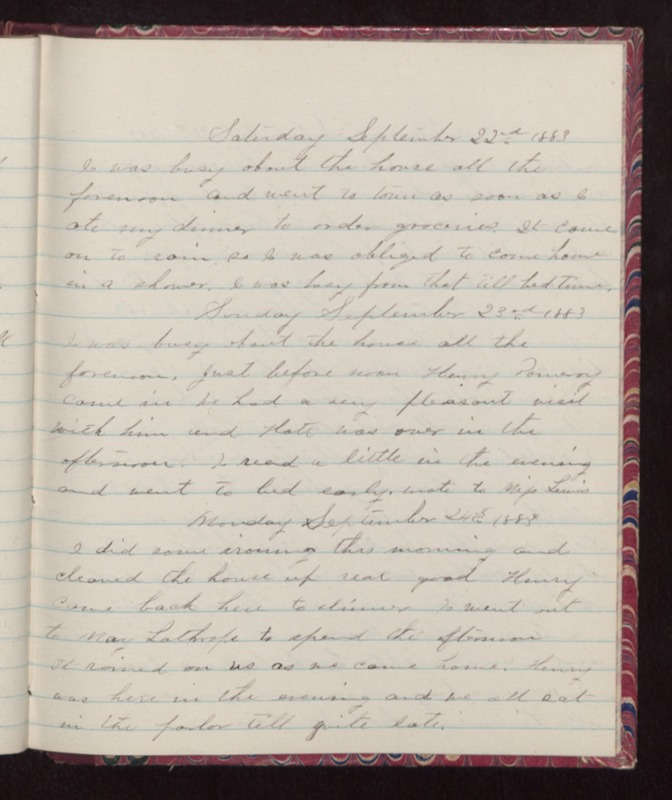 Sunday September 23rd 1883 I was busy about the house all the forenoon. Just before noon Henry Pomeroy came in We had a very pleasant visit with him and Hatt was over in the afternoon. I read a little in the evening and went to bed early. Wrote to Miss Lewis Monday September 24th 1883 I did some ironing this morning and cleaned the house up real good. Henry came back here to dinner I went out to May Lathrops to spend the afternoon It rained on us as we came home. Henry was here in the evening and we all sat in the parlor till quite late.